Congratulations! You have decided to adopt a German Shepherd Puppy. Surely you are excited and possibly don’t know where to begin. The process of finding the perfect GSD pup for you may seem long, but it is essential to your journey of choosing a pup that is best suited for you and your family. Following this helpful guide below will help you achieve your dream of adopting a GSD pup! First, decide the color coat you prefer your GSD pup to have. German Shepherds have a variety of different color coat combinations such as solid black, solid white, black and white, black and cream, black and tan, black, white and tan, sable and red. Choose the age range you prefer your future pup to be in. Do you want a young pup about 8 to 12 weeks old or is a pup a few six months or older better suited for you? 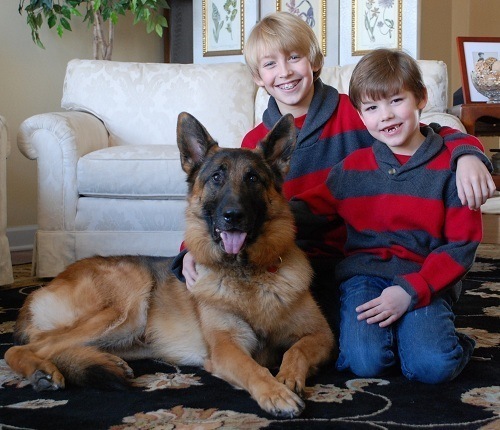 Search online for local German Shepherd shelters that offer adoptions to the public. You can also ask family and friends if they can recommend a shelter or rescue organization that is reputable. Visit the shelters and rescue organizations of your choice. When visiting, these locations bring a notepad along with you to write down important information. Your goal at this moment is to find a reputable and trustworthy shelter or organization. Ask the staff at the shelters questions. Remember to inquire about the history of the shelter, how they take care of the pups, their adoption process, the requirements for adoption and how long the process takes. If a shelter is asking for a lot of money for a GSD or any dog breed, you may want to research them further to be sure they are licensed. 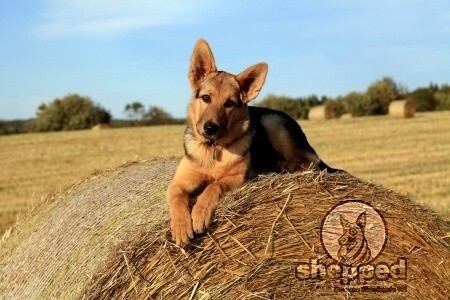 Visit with the German Shepherds that are located at the shelter of your choice. Get to know them by asking to see them separate from the other dogs. Try playing with them and talking to them. Observe the pup’s response to you. Is it positive? Or, do they seem afraid of you? Inspect the dog during your visit. Casually take a look at the physical condition of the pup. His or her eyes should be clear and clean; ears should be clean, and the skin, coat, and paws should be healthy looking. If you notice unusual things like cloudy or discolored eyes, limping, bruises or low weight, inquire with the staff at the shelter if the pup of your choice has any specific health issues. Keep an opened mind. Not all pup’s at the shelter are 100% perfect. If they have small problems or health issues that you feel you will be capable of helping him or her recover from then, continue on with the adoption process. Remember that certain health issues that are long term will require you to afford medical attention for most-likely the duration of the ailment or until it heals. You should be financially prepared for a lifetime of medical bills if necessary. Once you have chosen the perfect GSD pup for you, continue with the adoption process. Shelters have a variety of rules and steps to follow. Carefully follow each set of instructions and provide all information that is requested of you. Carefully fill out papers and patiently wait for the process to go forward. Some shelters can process the adoption within 24 hours while others may take a week or longer. Never get discouraged during the process. While you are waiting for the approval of the adoption process to come through. Take this time to prepare for your new GSD puppy to arrive home. Puppy proof your home. It is wise to get down on the floor to a similar height of your pup and see the world through his or her eyes. What are the objects and things that can cause him or her harm? Remove all toxic plants from your home, small choking hazards, remove chemical house cleaners that are stored on the floor. Clean up any clutter or items that you don’t want your pup to chew on. This means your favorite pair of shoes or your favorite blanket you keep on the sofa. Purchase a vacuum cleaner. 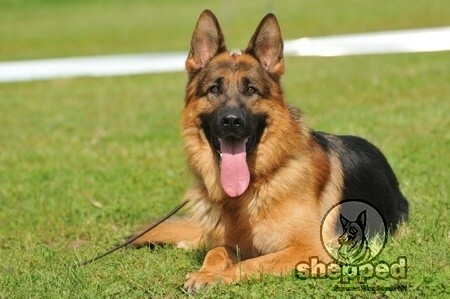 German Shepherds shed all year long and even heavier during certain seasons. Even if you have wood or tile floor, a vacuum cleaner will be beneficial at cleaning up the hair. You will also be able to vacuum the furniture, stairs and other areas of your home quickly. Purchase a bed for your pup. Make sure the bed is large enough so that he or she can stretch out in comfort. Also, make sure it is soft enough so that your pup doesn’t end up being uncomfortable. There are plenty of beds on the market today that provide a good amount of support. Purchase healthy food created specifically for the age range of your pup. Choose a dry food and wet food. It is wise to combine these two together. If you only feed your pup wet food on a constant basis, he or she will experience loose teeth from lack of exercising their teeth and gums. Hard food helps prevent this from happening. Choose food and water bowls. This is where many dog owners have fun choosing colorful and festive puppy necessities. Remember to choose bowls that are large enough for your pup to eat out of comfortably. Bowls that are too small can cause difficulty with your pup reaching his food, and it may deter him from eating. Or, he or she may become creative and purposely flip the bowl, so the food goes all over your floor and becomes easier to eat. Pick out a collar and leash. Collars come in a variety of styles and colors ranging from leather to soft, durable material. Choose the festive style and a durable leash to go along with it. You can choose a collar that goes around your pup’s neck or a harness style. Invest in identification tags. At this point, you should probably have chosen a unique name for your GSD pup. Purchase identification tags and make sure you put valid and important information on it, such as your pup’s name, address, phone number and any medical ailments or health issues. This is all essential details that are beneficial if your pup gets lost one day. This way the person that finds your pup will know these important details and return him or her home to you as quickly as possible. Purchase a dog crate. All dogs are den animals, and they love to feel safe and secure in small spaces. Providing your GSD pup with a crate that allows him or her to stand up, turn around and stretch out fully is beneficial to your pup’s well-being. Purchase grooming essentials such as shampoo and brushes. If you plan to take your pup to a groomer, it is wise to contact your local groomer and inquire if an appointment is necessary. You will also want to assure that the groomer is a licensed business and confirm the services they offer. Most groomers provide services such as bathing, ear cleaning, teeth cleaning and nail clipping. Find a licensed veterinarian. Your pup is going to need regular medical checkups to live a long healthy life. Locate a veterinarian or animal hospital in your area. Contact the veterinarian office and inquire about office visits, appointments, and pricing. Advise the staff that you are interested in bringing your pup to their office on a regular annual basis or as needed. Inquire if the first visit needs an appointment or if you can walk-in. Purchase pet insurance. Some countries offer pet insurance for a low monthly fee. It usually covers a percentage of office visits, vaccinations, exams, laboratories, testing and more. Inquire which package will be best suited for you and your pup. Schedule a vacation from work. This sounds a bit extreme however it is beneficial if you can get approved vacation time from your job. Taking a few days off from work will allow you to spend quality time with your pup when he or she first arrives home. It will allow you to get acquainted with your pup as well as give you time to schedule your pup’s first veterinarian office visit. Sign up for training classes or choose to train your pup on your own. As soon as your pup comes home, you will want to begin teaching him or her, the rules of the house. House training and obedience training should be at the top of your list of training priorities. Prepare your yard for your pup. If you have a yard, make sure it is clean. Remove any debris, old boards, nails or any items that look like they can injure your pup. Since your pup will most likely be curious about his new surroundings, make sure the fence is in good condition. Make any repairs to weak, rotten or missing spaces. You will also want to create a barrier under the fence if there are any spaces underneath.Using large rocks or wire fence is a great way to deter your pup from escaping your yard. If you plan to let your pup spend some time outdoors, you will also want to build or purchase a dog house so that he or she is safe from harsh weather conditions and have a safe place to rest. Remove toxic plants from your garden and landscaping. This includes toxic flowers, bushes, and trees. Plant trees and other non-toxic plants in place of the ones you remove. If you don’t have a tree in your yard, you may want to consider adding one. This tree does not have to be big, but it should be a good size so that it provides shade for your pup. Create a personal space for your pup indoors. Choose a small section of your home that will be specifically for your GSD pup. This is where his or her bed and crate will be and stay. Your pup needs to know there is a place that is all their own. They may need to retreat there for rest. Provide plenty of toys. This is highly important because it keeps your pup’s mind occupied and provides endless hours of fun. There are a variety of toys to choose from such as soft plush toys, rubber toys, ropes and plastic toys that hold treats. These specific toys are perfect for keeping your pup busy and interested. Purchase or build a small gate that will easily fit over the doors in your home. These are similar to gates used to keep human babies from leaving a specific room or from going down a staircase. Purchase a dog car seat. This may sound like an odd suggestion, but it is essential to everyone’s safety. You will most likely be bringing your pup home in your car or truck. You will need to secure your dog comfortable to the seat so that he or she does not jump on you or cause an accident. Some pups get nervous in cars and can climb on your lap blocking your vision and causing you to drive off of the road. Prepare your family for your pup’s arrival. Discuss with your family and children that there will be new rules in the house once your German Shepherd pup arrives. This includes cleaning up small objects and being careful not to leave food such as chocolate and raisins which are toxic to dogs in open spaces where your pup will easily consume it. 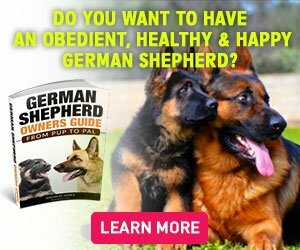 Once you have followed the tips in this (hopefully) helpful guide you are ready to welcome your German Shepherd puppy home. Your approval phone call should be arriving any day, and you will be driving to pick-up your new family member. It is wise to take your puppy to the veterinarian as soon as possible for a first checkup so that you are aware of any health issues. It is also a good chance for your pup to learn that this will be part of his new lifestyle.